Snow Like Ashes has everything you could want in a fantasy novel: a big and interesting world with a well developed history and magic system, a likeable kickass female heroine taking on an evil tyrant, a growing rebellion, father figures, complicated friendships, alliances, battles, secrets and so much more. Worldbuilding and equality: the different kingdoms in Primoria are evenly divided in patriarchies and matriarchies. Meaning we have both powerful kings and kickass queens! Plus, the season kingdoms, where one season rules all year long, are super cool and well thought out. Not one, but two likeable male love interests: Now, normally I’m not such a fan of love triangles. But even so, I appreciated that this love triangle actually has you rooting for both love interests. They are both just so… nice. Also, I liked that even though there is a love triangle going on, the story never focuses on it for too long. There are still battles to be won and evil kings to be overthrown and luckily, they always come first. A complicated mentor / father figure. The character of Sir is quite the complicated one and I still have not figured him out. His relationship with his group of rebels, and especially Meira and Mather, is just so weird and awkward and I loved that. It’s a nice change of pace from the usual wise and super friendly mentor/father figure. So you see, this book has a lot going for it. And still I gave it 4 stars instead of 5. Because while it does a lot of things right, I still had a few small issues with it. One was that I never really connected with any of the characters other than Meira. Yes, both Mather and Theron are… nice. So while I think it’s good that I like them both, I want to also feel more than I do. I need to feel the emotions, sit on the edge of my seat, swoon and curse and feel the pain that at least one of them will get hurt. And right now, I just feel very ‘meh’ about each of them. I hope this will get better in the next few books, AND do so without turning either one of them in the token bad guy. Also, this was kind of predictable. The major plot twist was telegraphed from the first chapter and when the big reveal finally came it felt just as ‘meh’ as the characters. 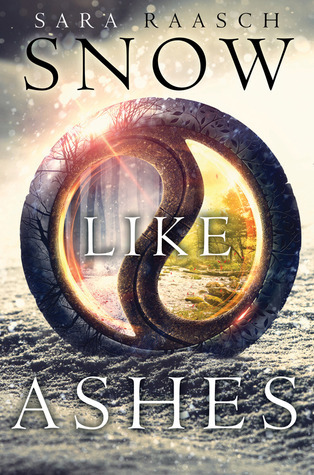 So overall, I really liked Snow Like Ashes, but I do expect more from book two to keep me interested. Have you read Snow Like Ashes? What did you think ABOUT IT? Ohh great review! I heard amazing raving reviews about this book and it looks and sounds absolutely fantastic! Thank you so much for your great post.